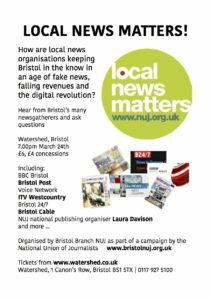 BRISTOL NUJ brings the city’s major and not-so-major newsgatherers together on March 24 for Local News Matters – part of the union’s national campaign to emphasise the importance of a healthy local news industry. Representatives of the Bristol Post, the BBC, ITV West Country, Bristol 24/7 and the Local Voice Network are among those taking part in a panel discussion and public Q&A at the Watershed on March 24. Bristol has its long-established media players such as the Post and the BBC, but it’s always been a city of innovation, and there are now numerous magazines and websites serving the city. Bristol 24/7 focuses on news, entertainments and food, online and in a monthly magazine; there are numerous magazines which focus on music, dining and so on. Since 2011 the Local Voice Network has been growing its stable of hyperlocal magazines: from April there will be 15 monthly Voices across the city region, reaching as far as Yate and Keynsham, funded entirely by advertising. The Voice model is similar to a franchise, with six independent publishers producing their own magazines – totalling well over 100,000 copies per month – and cross-selling advertisements between the editions. Other new players include the Bristol Cable media co-operative, which is funded by its 1,500 members. It covers stories it feels other media are not so likely to touch, and it has won wide attention with items such as its revelation that Avon & Somerset police had bought equipment capable of mass intercept of mobile phone calls over a wide area, which was picked up by national media. Another new community magazine is Vocalise, set up in St Paul’s, where there was no local news provider, by Arkbound, another new Bristol publisher which also publishes Boundless, a magazine with an environmental slant. Bristol also has its own local TV station, Made in Bristol. Set up amid predictions it would fail like all similar efforts, it is still going two and a half years later. Also attending will be Laura Davison, the NUJ’s national organiser for the publishing sector, and representatives of the journalism department at the University of the West of England. It’s hoped the event will be attended by MPs and candidates for the Metro Mayor elections to be held across Bristol, Bath and South Gloucestershire in May. The Local News Matters campaign highlights several reasons to cherish the local media scene. Local newspapers, websites and associated apps are read by 40 million people a week and enjoy a high level of trust from their readers. Democracy depends on voters being informed. Local media has a vital role to play in informing citizens of their local democratic institutions and by keeping politicians and quango chiefs to account. Research has shown there is a link between poor local news coverage and participation in local elections. Local media acts as a watchdog for its readers, listeners and viewers. People trust their local reporters and see them as someone to go to when there has been an injustice. Local journalists are breaking important stories, many with a national significance. They also provide vital and entertaining local information that encourages active citizenship, democratic accountability and accessible public scrutiny. According to Press Gazette, there has been a net loss of almost 200 newspapers since 2005 and during this period the number of journalists has halved. Numerous daily titles have gone to weekly publication and many weekly titles no longer have dedicated editorial teams. The event is at the Watershed at 7pm on Friday March 24. Tickets are £6; for NUJ members and concessions £4.